Many of the people who get so much enjoyment out of spending quiet time on the water, don’t live anywhere near a waterway and have to transport their canoes on top of their car, for these people lightweight canoes are really the only option. Transporting the canoe isn’t the only reason to prefer a lighter canoe, they can also be more maneuverable and stronger in many cases. Today we have many options when choosing which material our canoe is made out of. We have the choice of wood, aluminum, Kevlar,carbon, Royalex, and fiberglass. The vast majority of canoes that are made today are made from fiberglass since fiberglass is strong, lightweight and inexpensive. But when it comes to buying a fiberglass canoe, buyer beware, not all fiberglass canoes are created equal. A well built fiberglass canoe will use long (and fairly expensive) strips of fiberglass to build the canoe, a less expensive short cut will entail using small fragments of fiberglass or chopped fiber which is less expensive but not nearly as strong. It’s hard to know which method was used to build a canoe, price alone may not tell you the whole story. It’s best to read up on the manufacturing process used by any given company before you actually purchase a canoe from them. Another very good material for building lightweight canoes is Kevlar, just like in a bullet proof vest. Kevlar is very durable and perfect for the strength without weight that many canoe manufacturers are looking for. Typically canoes made of Kevlar will be better suited for use on calm lakes and streams. The biggest downside to using Kevlar to manufacture canoes is that it is very expensive and will greatly increase the price of the canoe. Carbon is another material that is used by some canoe manufacturers. It is lighter than Kevlar, though not as strong. It is a good compromise when you can get by with a little less strength but really need a canoe that is lightweight. Royalex is a good alternative for a lighter canoe too. It is a good compromise of strength and weight and is good for those paddlers that want to take on some white water. If you need to keep the weight down you should never consider a canoe that is made of wood or aluminum. Wood canoes can conjure up nostalgic images of days gone by, a well built wooden canoe can be as beautiful as any work of art, but they are very expensive, heavy and high maintenance. Aluminum might be a good choice as a ‘working’ canoe. It’s perfect for fishermen since it’s very inexpensive and low maintenance, but it’s also heavy and tends to get stuck in the rocks very easily. 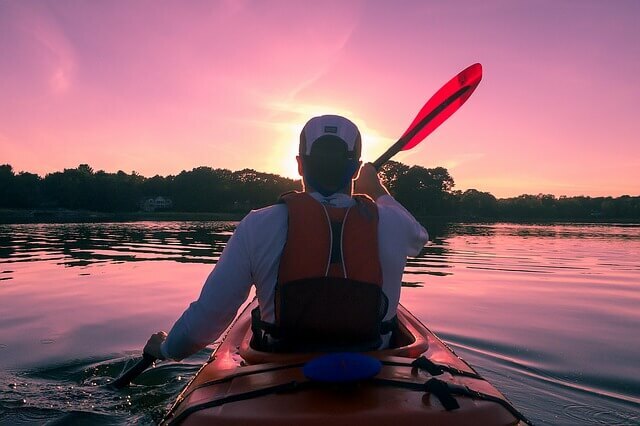 If you’re like me and you want to be able to enjoy the solitude of a quiet day on the water in a canoe but you’re land locked, you’ll want to find the best type of lightweight canoes for you and your budget. You do have several options to choose from, so do your homework and maybe I’ll see you on the water! Operation Self Sustainability - Wilderness Survival Tips - How to find water & food!